Banner Displays vs. Advertising Flags - Which Is Best for Your Business? If your St. Louis business has a physical presence, you understand the importance of printed materials to help inform your target audience. In printed promotional marketing, both vinyl banner displays and advertising flags continue to be vital components of any local marketing strategy. So which one is right for your marketing campaign? Before you even begin to think about printing in St. Louis, you should determine whether to prioritize banner displays or advertising flags. Both come with significant advantages, but in certain situations, one may be more advantageous than the other. Vinyl banners offer your business the opportunity to stand out through a visual display. They are generally retractable, allowing for easy transportation and a more mobile business presence. Banner displays come in a variety of sizes, typically 33″ wide and up to 80″ high. Printing options, such as UV protection and thickness of material, allow for both indoor and outdoor use. Similar to vinyl banners, advertising flags enable businesses to increase their visual presence. A large canvas up to 15-feet high leaves plenty of room for attractive graphic design. Businesses can choose between two layout styles, feather or teardrop, to attract attention to their brand. These flags are most often used outside, but their stand enables indoor usage, as well. The cost of printing these flags usually includes a carrying case that eases transportation for event-based marketing. But despite their similarities, banner displays and advertising flags are not quite the same. So which one is better for your need? That depends on the individual situation and usage intent. Are you looking for the piece to simply draw attention to your business? In that case, advertising flags are your best choice. Their height makes them ideal attention getters, showcasing your brand to an audience both indoors and outdoors. Banner displays, on the other hand, work best in a setting where getting initial attention is less important than directing that attention to you instead of competitors. In a trade show setting, for example, an advertising flag will do little to attract potential customers to your booth, but a banner display allows you to more easily earn passerby attention. The reason banners work so well in going beyond initial exposure is because of the added space for content. The height of advertising flags makes them great at garnering attention at a distance, but once your audience gets close, banner displays allow you to include more information that’s easily readable from close by. That, in turn, makes the content you include on your printed advertising piece a crucial factor in determining which of the two works best for you. A simple tagline like “Open House” or “Sale” works great on a flag. But if you want to highlight the core benefits of your business and brand, consider a banner instead. While it should still prioritize visuals, you can also add a few lines of text that are impossible to fit on an advertising flag. The content you add to your piece also depends on just what your printer allows you to to include. In most cases, banner displays are completely customizable, offering a blank canvas for businesses looking to add imagery or text to the design. Advertising flags, however, may not be quite as customizable. Because of advertising flags’ limited space, many print shops will offer templates into which your design must fit. That results in lower prices, but also less ability to get the exact custom flag that you had in mind. 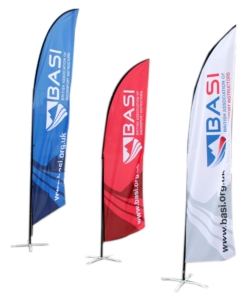 Both banners and advertising flags are portable. But sometimes, simply being able to pack up a promotional item is not enough—especially if you travel outside of St. Louis. If you do a lot of traveling to help attract new customers, you need not just portability, but convenient portability. Generally speaking, banner displays pack up smaller, but are also heavier. Weight may be an important factor, especially in air travel. Here’s a pro-tip from experienced trade-show marketers: mail your banners ahead of time to avoid overweight-baggage fees at the airport. Of course, budget considerations will play a role (especially for small businesses) in deciding whether to print banner displays or advertising flags. Advertising flags generally require less of a smaller up-front investment, as you can print a full-sized advertising flag for as little as $50 at your St. Louis print shop. However, you should also consider the importance of durability in determining your costs. 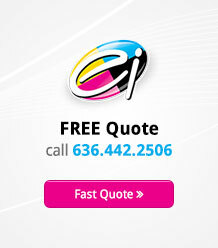 Naturally, getting more use out of a quality print marketing piece will ultimately mean a higher return on investment. Consult with your print shop to better understand the durability of material and structure. Used correctly, advertising flags and banner displays can both play a significant part in helping your business stand out and attract your audience’s attention. But though they may appear similar, their benefits vary significantly based on your needs. Understanding both pieces helps you make an informed decision about how best to promote your business. Of course, you may find yourself in need of both banner displays and advertising flags at once. In that case, printing both is a natural choice. Either way, knowing the use and individual benefits of each piece can help you both streamline your efforts and optimize your budget.